Do you travel a lot? Maybe you just like to organize small objects to take with you. If you do the Travel Tabbi is great for that. It’s a flexible mat that has pockets to organize your vitamins and supplements. Debora Hankinson, developed the Travel Tabbi after growing frustrated packing bags full of supplements to travel with. She wanted something, flexible, durable and travel-friendly. She has achieved her goal! I was impressed with how soft and flexible the outside container is. It folds up easily and is built nicely. It has an elastic band that holds it shut. The band is thick and strong and will hold up to multiple uses well. Inside thee are eight individual pockets that are held in place with Velcro. You can remove the pockets easily and interchange them according to your needs. I can see multiple uses for this container. It’s not something I would use for medications and vitamins in my own home simply because I have a three year old who likes to eat medicine. It’s not secure enough to keep her out of it. However if you have older children then it would work wonderfully for that purpose. It would hold up well to travel and I’m considering getting one for my Father in Law who is on the road three weeks every month. He is always complaining about packing up his medicines. My girls immediately locked in on the idea that it would hold their pony tail bands and clips. They have begged me everyday for the last week to give it to them. If you don’t have hair clips and bows laying around your house, it would be very useful as an on the run office organizer. You could easily put paperclips, eraser and change in any of the pockets. If you have a bottomless pit for a purse it could help you find the small things easily. I’m half tempted to keep it for myself for that purpose or order another one for my girls. I was given Travel Tabbi for review purposes. I was not financially compensated for this review and this is my honest opinion. I love that the pockets are removable! Although, that may also be something I come to dispise. I’m really good at loosing things it seems. What a neat product…I like the fact that it is customizable and durable, thanks. Just fill tabbi’s pockets, roll, and go. Your supplements will be protected while traveling. 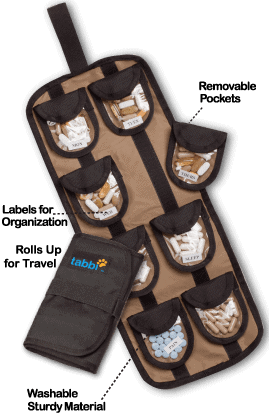 My favorite feature of the Travel Tabbi is the extra convenience provided by the individual, detachable pockets. You can remove the pockets. My favorite feature by far are the removeable pockets. Thank you for such a wonderful review! Good luck to those who entered the contest.